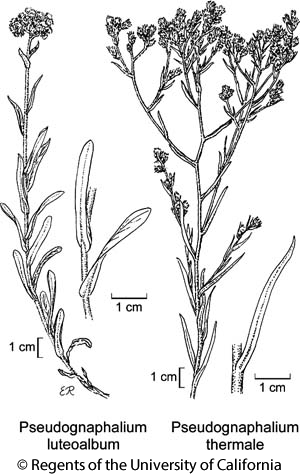 Habit: Annual, tap- or fibrous-rooted, unscented. Stem: 1--6 dm, loosely tomentose, not glandular; internodes 1--10+ mm. Leaf: proximally +- crowded, distally +- widely spaced, 1--6 cm, 2--8(10) mm wide, linear to narrowly obovate or +- spoon-shaped, distal smaller, +- clasping, generally decurrent 1--2 mm, margin generally curled under, faces generally +- gray-tomentose or adaxial +- glabrous. Inflorescence: generally +- long-peduncled, dense to +- openly cyme-like; involucre 3--4 mm, widely bell-shaped when pressed; phyllaries in 3--4 series, ovate to ovate-oblong, silvery-gray to +- yellow or brown, transparent, glabrous or proximally tomentose. Pistillate Flower: 135--160. Disk Flower: 4--10, corolla yellow or red-tipped. Fruit: papillate; pappus bristles loosely coherent, shed in clusters or easily fragmented rings. Chromosomes: 2n=14,28. Synonyms: Gnaphalium luteoalbum L.; Gnaphalium luteo-album, orth. var. Citation for this treatment: Guy L. Nesom 2012, Pseudognaphalium luteoalbum, in Jepson Flora Project (eds.) Jepson eFlora, http://ucjeps.berkeley.edu/eflora/eflora_display.php?tid=101867, accessed on April 24, 2019. No expert verified images found for Pseudognaphalium luteoalbum. NCo, SNF, GV, CW, SW; Markers link to CCH specimen records. Yellow markers indicate records that may provide evidence for eFlora range revision or may have georeferencing or identification issues. Purple markers indicate specimens collected from a garden, greenhouse, or other non-wild location.